Peter Frampton's latest album, "Thank You Mr Churchill," is intimate and autobiographical. Peter Frampton's new album is "Thank You Mr Churchill"
Los Angeles, California (CNN) -- It's been a long time since "Frampton Comes Alive" and even longer since he was the "Face of 1968." Those were the days when he had to be a crowd-pleasing teen idol. But these days, Peter Frampton makes records for himself. First, there was 2006's Grammy-winning instrumental album "Fingerprints." "That was the first record I'd done that I didn't care what anybody thought of it. It was the right time for me to just go and do exactly what I needed to do," Frampton said. Last month, the famed guitarist released "Thank You Mr Churchill," perhaps his most diverse, intimate and autobiographical album to date. The sense of freedom on "Fingerprints" continues through "Churchill," with Frampton conjuring a latter-day George Harrison in the radio-ready "I'm Due a You" and bows to the altar of the Funk Brothers, Motown's old house band, in "Invisible Man." The album also features an impressive backing band, with Matt Cameron (Pearl Jam, Soundgarden) on drums, Benmont Tench (Tom Petty and the Heartbreakers) on keyboards and Craig Young on bass. The Kent, England, native says his songs are braver now. "I've tackled some new things here," he said. Now several years sober, Frampton felt more comfortable looking inward and facing intense personal struggles such as the recent deaths of his parents. "Their loss was awful, but I look at my time with them and my family, [and] that has made me smile. As time goes on, the grief changes into wonderful memories. I've got my family. I can look back if I close my eyes, and we're all together again. The best times of my life are up the road. I'm with my family and my children. And so it goes," he said. CNN spoke to Frampton about his second act, musical validation and his most meaningful collaboration. The following is an edited version of the interview. CNN: People who may only know you as the '70s rock god, what can they expect from this album? 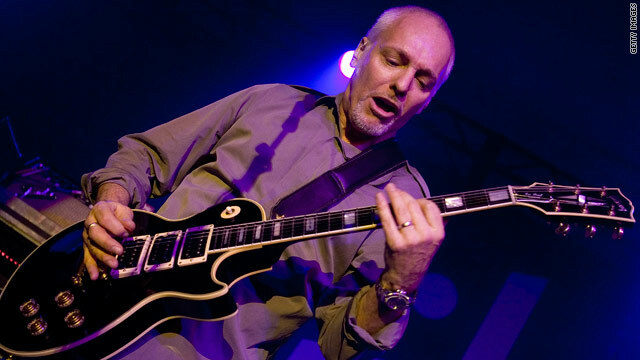 Peter Frampton: I know that very well because of my Facebook page, and there are still people that worry about the fact that I don't have golden locks anymore. So I'm very aware of how some people are locked in that time. They have just got to hear the album. They've got to listen to the music. They've got to come hear me play live. We can transition them very well if they come to the concert. We'll bring them right up to date. CNN: Going back to your previous album, "Fingerprints," what was it about that record that led to a creative resurgence? Frampton: First of all, I think that "Fingerprints" was the first CD I made with my new birthday, being that I'm seven years sober. That played into the equation big time. I'm not preaching; it was just the right thing to do. I think that this album is an [extension of that]. Receiving the Grammy was a shock, actually, but it definitely gave me a feeling of final validity as the musician I've always been. It changed the perception of me in so many ways. I think I lost my father halfway through "Fingerprints." And then Mom left us in the interim. And they're gone, and it's a realization that now you're an orphan. And it's a completely different feeling. You don't know until you experience it, and that definitely affected my way of looking at life. CNN: What did creating this album reveal to you about yourself? Frampton: I think that in a way, it let me realize how important my family is to me. I'm learning all the time. I've learned things like how to be a better person, better father, better husband. I use to say it was painful to write lyrics about myself and looking inward. I've found this very refreshing. It's just a weight off my head. CNN: Do you think you're able to do that because of the sobriety? Frampton: I'm sure that I am enjoying my sobriety. And respect it. If you've been through what I've been through, then you really do treasure it. And I look after it. Frampton: Oh, my goodness. To actually be in the studio with the original Funk Brothers and cutting a song we wrote for them, "The Invisible Man" ... it was one of the most incredible days of work -- if you can call it that -- that I've ever experienced. CNN: Speaking of collaborations, there's a rather special one on "Road to the Sun." And then of course when I told Julian he was going to be on the record, I said, "Matt Cameron's gonna be on the track," and he just about dropped the phone. He is his favorite drummer, being a drummer himself. He was just floored. And the vocal you hear is the first take. I'm so honored to be able to say that my son was able to do it on the first take. That's a proud papa right there. CNN: Do you think you have been able to come back and do all this had you not gone through everything you'd gone through in the late '70s and '80s? Frampton: What doesn't kill you makes you stronger. That's for sure. I believe that I started strong. Some might say I didn't pay enough of my dues, and I think I've paid my dues. You keep paying dues. But I think I had a strong start, and I'm going to have a strong finish.